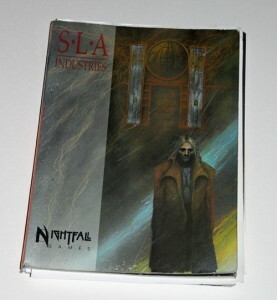 Nightfall Games published SLA Industries, a science fiction role-playing game, in 1993. I bought my first copy pretty much as soon as it was published. SLA was a breath of fresh air (or maybe that should be rank but fast-moving air) with a definite British sensibility. In the great tradition of all early copies of SLA it promptly fell apart. It easily ranks as one of the most heavily abused role playing books I own. If it was a house being advertised for sale it would “need some renovation”. SLA carries a warning that it is intended for mature gamers. The same warning applies to all the following pages.